Above: A false-color image of the mid-infrared emission from the Great Galaxy in Andromeda, as seen by Nasa's WISE space telescope. The G-HAT team used images such as these to search 100,000 nearby galaxies for unusually large amounts of this mid-infrared emission that might arise from alien civilizations. Caption and image credit: NASA/JPL-Caltech/WISE Team/Penn State/Roger L. Griffith et al. Back in the 1960s, Russian cosmologist Nikolai Kardashev devised the famous scale that now bears his name . He proposed a simple numbering system — from one to three — that can be used to classify hypothetical alien civilizations according to the amount of energy at their disposal. According to the scale, a K1 civ has captured the entire energy output of its home planet, while a K2 civ has tapped into all the power produced by its home star. But then there are K3 civs — so-called supercivilizations — who have tapped into virtually all of the energy produced by their own galaxy. As study co-author Jason Wright told io9: "Type III civilizations in the sense that Nikolai Kardashev originally defined them, were 'maximal' energy users: they command all of the starlight in their galaxy." This could be accomplished by ETIs in any number of ways, including vast complexes of Dyson spheres and the establishment of Matrioshka Brains. K3 civilizations should be reasonably easy to detect from a distance. According to fundamental thermodynamics, the energy pulled in by a K3 civ must still be radiated away as heat in the mid-infrared wavelengths. These galactic-scale signatures, though far away, can still be detected from Earth. With this in mind, a team of astronomers from Penn State recently completed a survey, known as the Glimpsing Heat from Alien Technologies Survey (G-HAT), of 100,000 galaxies to see if they could find traces of galaxy-spanning supercivilizations. Their results now appear in the Astrophysical Journal. The G-HAT team, led by postbaccalaureate researcher Roger Griffith, analyzed practically the entire catalog of detections made by NASA's WISE orbiting observatory. That's nearly 100 million entries. The researchers honed this list down to ~100,000 of the most promising candidates, looking for objects consistent with galaxies emitting too much mid-infrared radiation. No obvious alien-filled galaxies were detected. "We have shown that among the 100,000 galaxies that WISE can resolve, none of them contain such civilizations," Wright told io9. "This doesn't mean, however, that there are not galaxy-spanning civilizations in any of those galaxies, just that if there are, they aren't using most of the starlight for their own purposes." 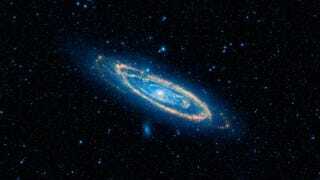 That said, 50 galaxies did feature higher-than-usual levels of mid-infrared radiation. Further analysis will be required to determine if they're caused by some natural astronomic process, or if they're an indication of highly advanced extraterrestrial civilizations. This poses a bit of a problem for astrobiologists. Back in 1975, astronomer Michael H. Hart conjectured that super-advanced aliens should be able to colonize an entire galaxy within a reasonably short amount of time (at least from a cosmological perspective). Either that or humanity is alone in the Milky Way. It's this line of reasoning that led the Penn State researchers to conduct their inter-galactic survey. "There has been a line of argument, originating with Michael Hart, that there should not be any advanced civilization in the Milky Way, because if there were, they would have taken over the entire galaxy by now," Wright told io9. "If this is correct, then our search for civilizations spanning other galaxies is the best approach." Wright concedes that there may be a flaw in this reasoning, adding that many respected SETI researchers believe it's incorrect. "So if, even as we refine our techniques, we continue to find no hint of intelligent life pandemic to other galaxies, this would strengthen the arguments of those who disagree with Hart's argument, and make searches within our own Milky Way an even more promising venue," he added. The next step for the G-HAT team is to scale things down a bit to see if less energy-intensive civilizations might exist in these galaxies. This is where Carl Sagan's adjunct to the Kardashev Scale might come in handy. "On Sagan's scale, we want to push down from Type 3.0 to Type 2.9 or 2.8," says Wright. "That is, search for civilizations using 10% or even 1% of the starlight in a galaxy." Encouragingly, the new study shows that WISE has the sensitivity and resolution to do this, but as Wright told io9, it would require careful examination of the light from these galaxies across the full range of the electromagnetic spectrum, and not just the emission WISE sees. Also, the researchers want to extend their method to K2 civilizations. In other words, they want to search for Dyson spheres and/or other megascale artifacts produced by advanced aliens. "This will require us to be able to distinguish distant, dusty giant stars from nearby, Sun-like stars with much of their starlight being collected by an advanced civilization," says Wright. "This is very hard because it requires spectra or distance measurements, which we do not have for most stars — but the ESA space telescope GAIA will measure distances to all of the nearby stars, making this search possible for the first time. We look forward to using those data to extend our search to the Milky Way." Read the entire study at the Astrophysical Journal: “The Ĝ Infrared Search for Extraterrestrial Civilizations with Large Energy Supplies. III. The Reddest Extended Sources in WISE.”. Contact the author at george@io9.com and follow him on Twitter.